The 1.5 TSI is the first engine of the renewed EA211 evo family introduced in 2016. It is a 1.5-liter four-cylinder direct injection, gasoline turbocharged engine with Miller-cycle combustion. It is assumed that the new 1.5-liter engine will replace the well known 1.4 TSI engine in Volkswagen Golf and other VW’s vehicles since 2017. The 1.5 TSI evo is based on further improvements to the EA211 engine. The crankcase (cylinder block) has the new design of water jacket and is made from aluminum alloy also. The 96 kW 1.5 TSI has cast-in iron cylinder liners (sleeves), while in the 110 kW engine, the liners are coated using the atmospheric plasma spray process (APS). The engine kept the same bore of 74.5 mm. The displacement of 1.5-liter TSI has been achieved by increasing the stroke from 80.0 to 85.9 mm. The bottom end got new crankshaft, the connecting rods with a finish-forged small end (they are designed without bushes), and the new cast aluminum pistons with flat piston heads. All components were designed with low friction strategy, so there are thing pistons rings, DLC coated piston pins, and etc. The engine has an aluminum alloy cylinder head with the new shape of combustion chambers designed for the more efficient combustion process. The water jacket was also revised. Like the 1.4 TSI EA211 engine, there is the integrated exhaust gas manifold (iEGM) in the cylinder head of the 1.5 TSI which also has been redesigned and optimized. There are 4 valves per cylinder (two exhaust and two intake valves); the valve angle of the exhaust and intake valves is smaller (18.9 and 13.0 degrees) than before for the more compact combustion chamber and higher compression ratio (12.5:1). The 110 kW variant is equipped with sodium-filled exhaust valves for cooling purposes. The 1.5 TSI has the intake and exhaust camshaft (DOHC) driven by a zero-maintenance, low-friction timing belt. The camshafts actuate the valves via roller cam followers with friction-optimized grooved ball bearings on the drive end of the camshafts. The valve timing is equipped with variable valve timing system with a high-speed hydraulic camshaft actuator on the intake cam and the conventional manner actuator on the exhaust cam. Like the previous EA211 engines, the 1.5-l evo has the combination of high-temperature and low-temperature loops of the cooling system. The coolant circulation is provided by the mechanically driven cooling pump via a toothed belt by the intake camshaft and a modular, mechatronic coolant regulator. The 96 kW TSI evo engine has a turbocharged intake with variable turbine geometry (VTG), while the 110 kW version uses conventional valve timing and a turbocharger with a mono-scroll wastegate EGT. For temperature reduction of the charged air, there is a water-cooled intercooler fitted between the pressure pipe and throttle valve. The 1.5-l TSI evo was firstly equipped with the generation 4.0 Volkswagen direct injection (DI) system. The new system provides five-hole spray pattern, fuel pressure up to 350 bar and up to five injections per combustion. The engine has Bosch MG1 engine control unit (ECU). The 1.5 EA211 TSI evo with advanced valve timing system, thermal management, and ACT (cylinder deactivation) as well as friction reduction now consume less fuel by 10% than its predecessor the 1.4 TSI, at the same time, it meets modern emission requirements EU6 ZD without loss of power output, even became more responsive and pleasable fro driving. The 1.5 TSI is defiantly more reliable compared to the 1.4 TSI EA111 engine. 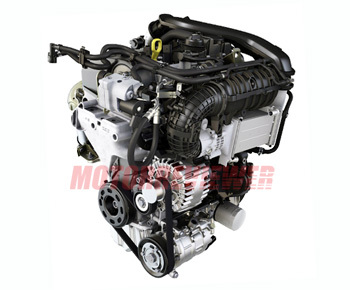 Most of common 1.4 TSI problems were eliminates in the next 1.4 TSI engine of the EA211 family. Now, the 1.5 TSI is based on huge experience in the engineering and production of small turbocharged gasoline engines. The next major direction is optimization of systems operation by applying better but sometimes expensive solutions. There is an opinion that VW shows the limits of combustion technology. In this case, the main problem of the 1.5 TSI engine is an expensive complexity in the background of the electric drivetrains simplicity in electric vehicles. DACA - 96 kW (128 hp) version for 2017+ VW Golf. DADA - 110 KW (150 hp) engine. Application: 2017+ Golf Mk7, 2017+ Skoda Octavia III 5E.